My Project Gorgon Steam key finally came through yesterday. My fault I didn't get one in the first place. Seems there was a "Survey"I didn't take any notice of right after the successful Kickstarter. A couple of reminders followed. Ignored those too. Turns out, the survey doubled as the information-gathering process Elder Games used to build a record of who was entitled to keys. That's why I wasn't among the 90% of Kickstarter backers who got in on launch day. After that, though, faultlines look a little less clear. I filled out the survey a couple of weeks ago. Emailed Support with full details of my Kickstarter eligibility. Got a reply in a day or two, saying I'd get a key in the next batch they sent out. I waited until yesterday. Nothing came. I sent a follow-up email. Got a reply the same day, from Eric Heimburg himself, with my Steam Key. I was quite impressed by that part, particularly with it being a holiday. I plugged the key into Steam, downloaded the game, synced the old account to the new. Tested it to check I could log in; I could. Thanks, Eric. My characters were both there ready to go but it was gone midnight. I logged out and went to bed. This morning I went back to take a look around. I have to say they've done the old place up nicely. 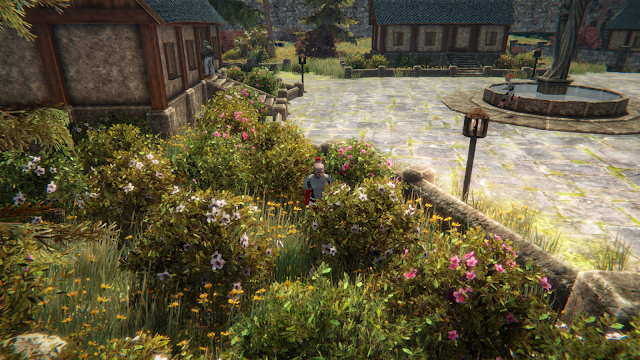 Everything seems much clearer and sharper than last time I played in alpha. The textures seem less gritty, the UI is much larger. Easier to follow. The font defaults to a point size I can easily read sitting back in my chair, which definitely wasn't the case before. I took a while, went through all the interface elements - Persona, Inventory, Quest Journal, the rest. Every one had improved. The whole thing felt more user-friendly, more comfortable, better than any stage in that long, long alpha. Much has been said about the graphics, most of it negative. My feelings are mixed. On the one hand it does have the feel of a game from the EverQuest era. On the other, I'm playing EQ at the moment and Project: Gorgon doesn't really look much like it. If anything it reminds me more of LotRO, with the rich fields of flowers and the relatively realistic late-medieaval buildings. It's always puzzled me that P:G looked its best way back at the very start of pre-alpha. When I posted about it in 2013 I commented "the walled, medieval village is one of the best I've seen in a game". The screenshots I took back then are very plainly more visually sumptuous, not to say photo-realistic, than even the High Definition shots I took today. If they could have kept to that standard I doubt anyone would have been criticizing the game now for how it looked. In alpha P:G tried on a number of appearances. The Steam version is better than any I remember. The mountains and clouds look a little off but the trees, fields, foliage and water all look perfect for a pleasant country stroll. The character models and the animations are still barely functional by 2018 standards but they're better than they were. My female rakshasa's running animation has improved significantly - all the way from ludicrous to bearable. Mobs are still clunky. So is combat. None of that really detracts from the pleasure of playing. Project: Gorgon is probably best-known for its wacky humor, its unconventional approach, its extensive, freewheeling skill system. That's not an unalloyed recommendation. I've commented before that a little of Eric's humor might go a long way. More than a sniff of the amateur dramatic society hangs over the whole enterprise and as a sandbox it's even less structured than most. Despite all that, though, there's never any doubting the sheer personality evident in every aspect of the game. The enthusiasm and good-nature of the tiny development team sweeps all cynicism away. Project: Gorgon is an MMO to fall in love with, a game whose shortcomings many will be willing to overlook in favor of its manifold novelties and wonders. To play it regularly you're going to need a lot of time. Time and patience. Not only are there all those skills to level up with no specific schedule or formula to follow, there are also plenty of old-school time-sinks, some not seen in mainstream MMOs for many a year. Whether you find that refreshing or frustrating may depend on whether you've encountered such things before or how much you liked them last time if you did. 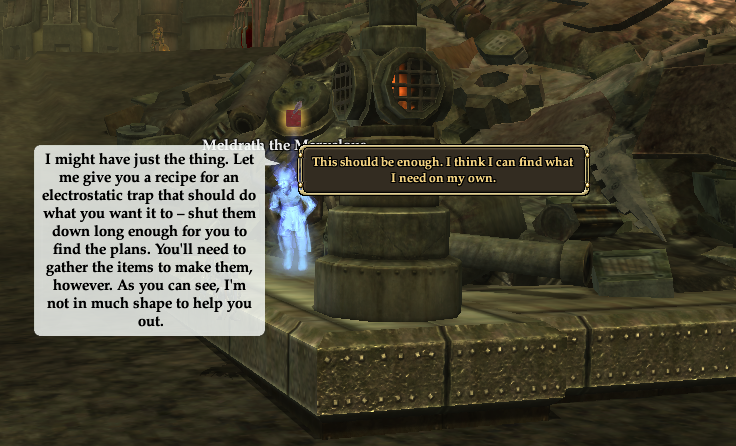 Personally, I never enjoyed having to speak to every NPC to see if they might have something for me. I don't relish having to make notes about where I met a questgiver just so I can find my way back to do the hand in, particularly when it might be days or weeks or even months later by the time I finally complete the quest. Neither do I like having to hunt down a particular NPC to sell a particular type of loot. Yes, it's much more realistic to have to sell your pig and deer meat to the woman who teaches you to cook it, but do you really want to walk right across town past half a dozen other vendors when all you want to do is clear your bags? As for the banking system that has you storing different kinds of items on different NPCs all over town, that might be unique to P:G. I dearly hope it stays there. Then again, the Player Work Order noticeboard that fills much the same purpose as the EverQuest barter system I was praising only yesterday is beautifully integrated into the infrastructure of the world. It's an elegant solution, as is the Trading Hall where player vendors stand in a convincing and above all visually appealing approximation of a country trade fair. I'm still not certain I'll ever dedicate the time and energy to this game that it demands and very possibly deserves. I fear that, as a casual potterer, dipping in and out for short sessions as and when the mood takes me, I'll never get to know the best of it, or even experience much of what makes it different. I imagine I'll mostly end up doing what I've been doing for the past five years: wander out of the gates of Serbule, take pot-shots with my bow at any passing pig or deer or brain bug, catch a few fish, pick a few mushrooms, watch random skills go up. 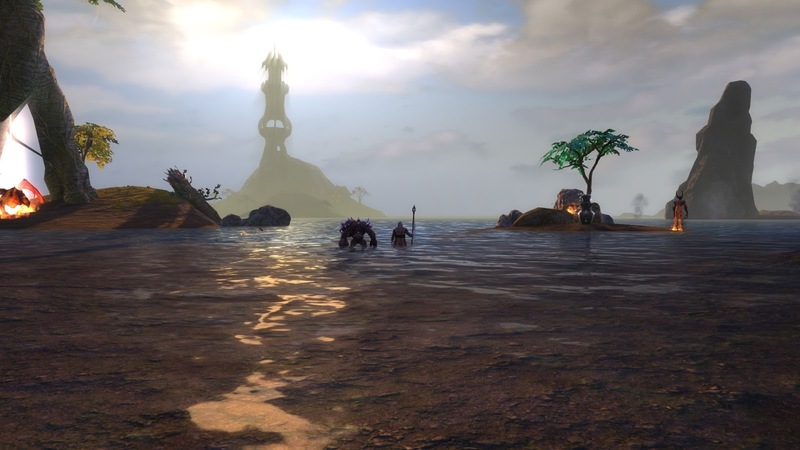 It makes Project: Gorgon feel like a less satisfying version of old-school EverQuest. 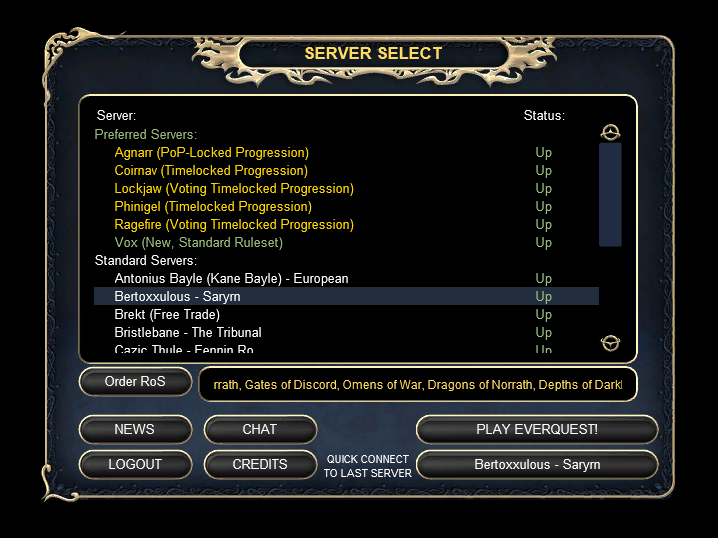 After an hour or two I tend to want to log out and go play EQ instead. That, though, says more about me and my MMO history than it does about Project: Gorgon. 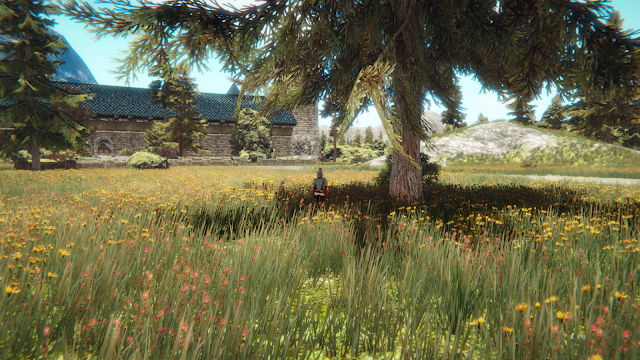 For those who find modern MMOs too cookie-cutter bland and old-school games that have been running for decades too cluttered and forbidding, this might just be the half-way house they've been looking for. Me, I'll keep dropping in and pottering around. I'm not expecting to get very far but I don't feel P:G is a game that cares very much about how far you get. It has always felt very comfortable and I'm glad it's there. If there's one thing you can be sure of when playing an MMORPG it's that you never know all there is to know. It doesn't matter if you have twenty max-level characters or you've been playing since beta. Never mind whether you lead a bleeding-edge raid guild or spend your free time writing guides and correcting the wiki, there's always, always going to be something you didn't know. 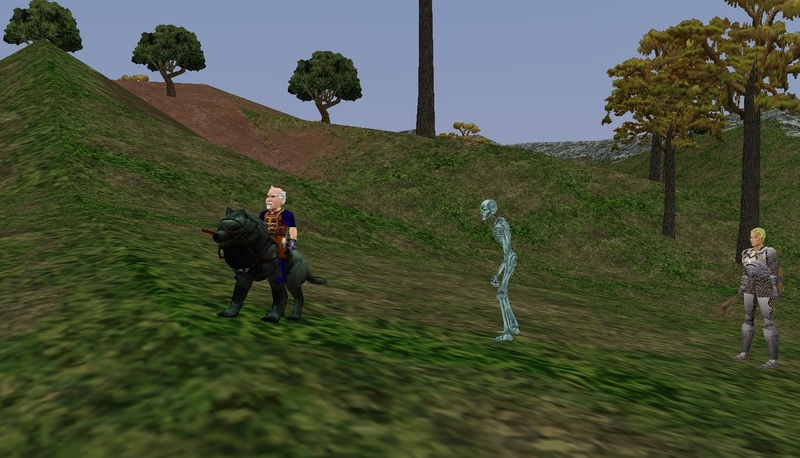 EverQuest is nineteen years old this year and I've been playing for eighteen of them. Over nearly two decades I've levelled more characters than I can remember (waaaay more...). I've played on servers that have merged into servers that have merged into servers until my character limits split at the seams. 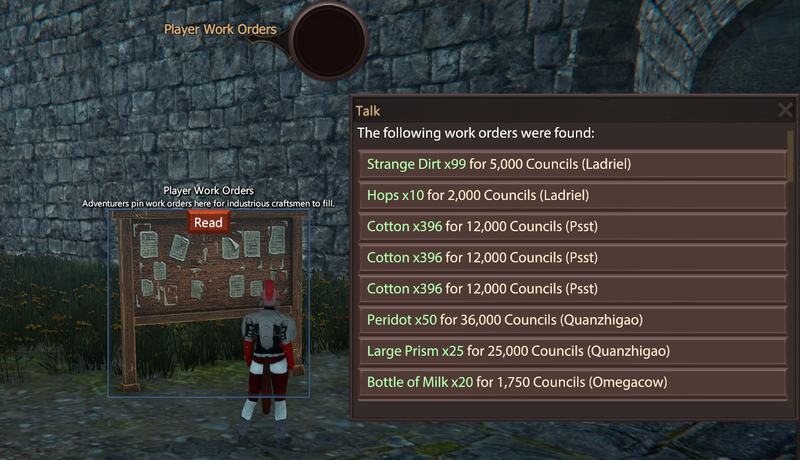 As I mentioned in my last post, the Barter system forms a crucial element in any low-level EverQuest money-making plan. Bartering was introduced with the Dragons of Norrath expansion in 2005. DoN was the expansion that followed Omens of War, which was the expansion that followed the one that almost put EverQuest out of business, Gates of Discord. The combination of a disastrous expansion (GoD), the launch of a sequel (EQ2) and the appearance of a ferocious competitor (WoW), all in the same year, was a body-blow that staggered EQ badly but there was no knock-out blow. 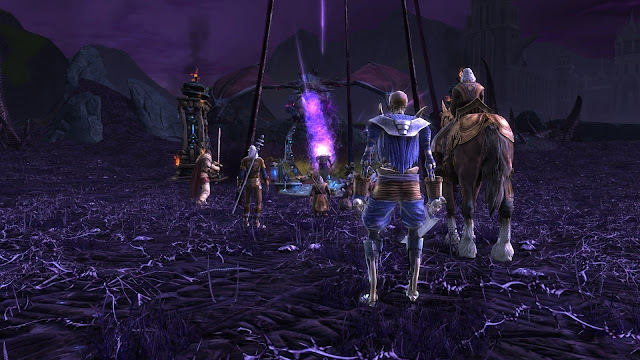 Omens of War, which cleaned up GoD's mess, was much better received, EQ2 stumbled out of the gate and World of Warcraft managed to gain a reputation in EQ veteran circles as an easy game for kiddies, best ignored. Swimming from across Lake Rathetear fro m Arena to South Karana. If there's a faster route I'd like to hear about it. By the time I came back to EQ, Dragons of Norrath was old news. Everyone was anticipating the arrival of the new expansion, Depths of Darkhollow. As I check the wiki for the dates, the cadence of these expansions is breathtaking. Between October 2002 (Planes of Power) and November 2007 (Secrets of Faydwer) SOE produced and released eleven expansions, all of which (with the exception of the mini-expansion Legacy of Ykesha) dwarf just about anything released as "expansions" for most MMOs nowadays. 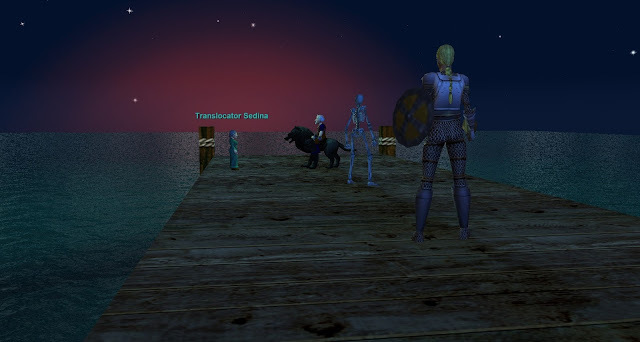 Some expansions added game-changing innovations: instant transport from a central hub with PoP's Plane of Knowledge; mercenaries in Seeds of Destruction; the Task system in OOW; instanced dungeons in Lost Dungeons of Norrath. 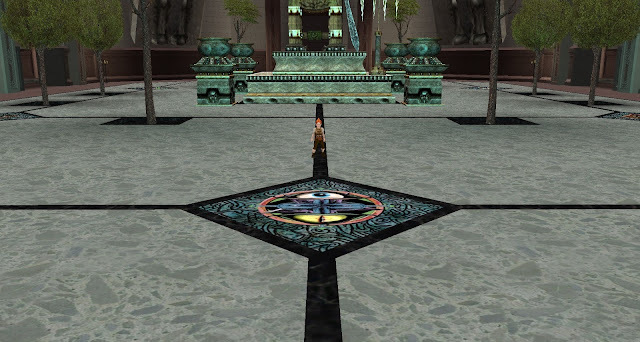 Others sought to shift the entire direction of the game - The Serpent's Spine in 2006 claimed to render the entire first 75 levels fully soloable as well as allowing all characters to regain mana and health quickly as soon as they were out of combat. Not every new idea worked or was taken up with enthusiasm by the players. DoD's Monster Missions had their moment in the sun purely because of an exploit. Once that was fixed did anyone ever use them again? Prophecy of Ro, my nomination for EQ's weakest-ever expansion, offered player-set traps and "spheres of influence", neither of which have I used, seen anyone else use or even heard anyone mention. And then there was the "voice macro system" from OOW... no, me neither. I don't remember them being called "Adult Elephants". I thought they were just "Elephants". Of all the many great additions we've enjoyed over the years, quality of life changes that make modern EQ so very much more enjoyable and satisfying to play than "Classic" ever was, Barter comes close to the top of my list. It's been so useful that I've never minded the clunky, inconvenient implementation that requires not just a visit to The Bazaar but a fiddly trip through the maze-like corridors of the Blue halls to find the player-vendor with whom your character needs to interact. 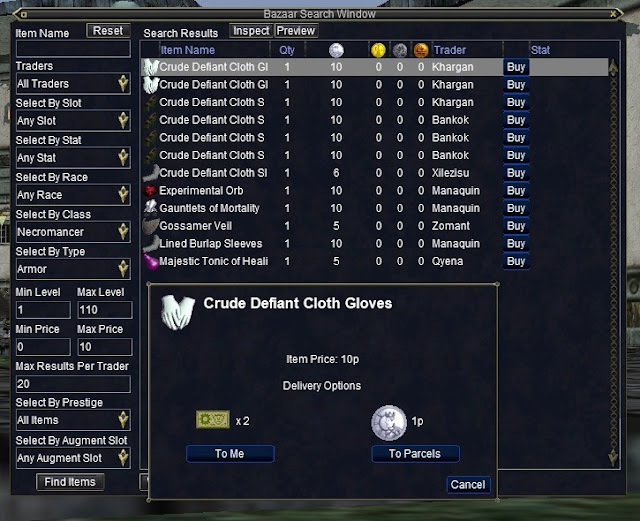 A trip to the Bazaar to type /barter and bring up the search window to see what people are buying has been a rite of passage for all my new characters for years. Many a hunting session has ended with a Gate to PoK and a run to the Bazaar. Then last night I discovered I'd been wasting my time. Not by using the barter system - that's as essential and rewarding as ever it was. No, it's just that I never needed to leave my hunting grounds to to cash in! I'd have known sooner if I read my own blog or took my own advice. I've recommended Almar's Guides more than once but it seems I haven't been reading them closely enough. I linked to Almar's Bazaar Guide in the last post to save myself having to explain The Bazaar. I checked first to be sure it was relevant but I trust Almar so I didn't do much more than a skim-read. Then last night something happened in game that made me go back and read it again, properly. You can never kill too many aviaks. I was in South Karana, down at the birdhouse, killing Aviaks for great xp and pretty good loot, when someone in General Chat asked a question about how to make some plat at low levels. Vox, the new (as in five years old) server where I'm currently playing has excellent General chat - lively, well-mannered, helpful. Answers and suggestions were offered. Someone was explaining Barter and I was half following the conversation when I saw something that made me exclaim out loud in surprise and disbelief. They were saying that you could check barter from anywhere in the game and then sell straight from your bags where you stood! Could that be true? Right there, mid-fight (my pet was doing the fighting and my merc was doing the healing so my involvement was optional) I typed /barter and the window opened. It was like a miracle. I grabbed the corner and stretched the window so I could see all of it and there, next to every listed item, was a blue "SELL" button. I searched my bag for something I could sell. Anything. I didn't have anything anyone wanted. For the rest of the session I scanned my loot obsessively as it came in, looking for an item I could use as a test. Finally a Steel Ingot dropped. They're always in demand. Only not today. Killing lions in the vain hope of getting the elusive High Quality Lion Skin, curently trading on /barter for 10,000 plat. In 19 years I've seen one drop. Eventually an Aviak Rook gave me some Sivril Ore. Someone on Barter wanted a few pieces for some arcane purpose. I clicked on the SELL button... and the ore vanished! A platinum piece clinked into my purse and the whole of Norrath changed in an instant. Being able to search and sell remotely is game-changing. It allows me to find a spot where things people want to buy drop, then stay there to farm them without having to gate to clear my bags and sell. Given the time it takes to travel and get set up to hunt in Norrath, this is a Big Deal. Yes, it only applies to the small number of items that players want to buy, but now I can check every drop to see if there's a demand and if there is I can sell immediately and clear a bag slot for more. This wonderful change was a feature of the Rain of Fear expansion in 2012. You have to own that expansion to use it. I have it on my lapsed All Access account, which is the one I'm currently playing. I'm not sure if I have it on my current All Access one but if I don't then I'll be buying it (or rather I'll buy the latest expansion, which will give me all the previous ones) if I start playing a character over there. I was particularly impressed to find I could use the function even though the account I was on isn't subbed. I already knew you could search the Bazaar remotely but I thought that was a perk of All Access. According to Almar "you can open the Bazaar tab anywhere in the world and buy items from anywhere in the world (Ownership of the Rain of Fear (RoF) expansion required). The same goes for using /barter. You can sell items immediately after picking them up from a monster and have the plat instantly placed in your inventory after you sell the wares!" I often used to check the Bazaar remotely when I was playing my Magician, back when hers was the subbed account, but my memory was that, when I tried after my subscription lapsed, the option was no longer available. Well, either my memory is faulty (likely!) or things have changed. (Or, it just occurs to me, I am confusing the usage of EQ's Bazaar with that of EQ2's Broker...the "too many Norraths" problem). Anyway, I just tested it and a F2P (Silver) account can check the Bazaar remotely. Not only that, there's a "BUY" button for /bazaar just like there's a "SELL" button for /barter. I found a cheap pair of gloves I needed so I could test it. I pressed BUY and another window popped up. Apparently you can pay via some kind of ticket to have the item delivered straight to your bags or pay a platinum fee to have it sent to a "Parcels" NPC. Since I didn't have any of the tickets and didn't know where or how to get them, and since I was in Plane of Knoweledge, home of every service known to Norrath, I chose "Parcels". Then I popped "Find" (another essential quality of life feature) and followed the glowing trail to the Small Bank, where a gnome by the name of Caden Zharik had my gloves ready and waiting. Clearly I need to read up on all this. I feel like I've been playing with blinkers on these past few years. How much more is there that I don't know? How many awkward, time-consuming aspects - "that's just how it is in EQ" - are really artefacts of my own ignorance? I don't know but I suspect a lot. It really is no wonder new players find it heavy going. You could say it should be better explained but it would need a manual the size of an encyclopedia and who would read it? Keep adding content for two decades and that's just what happens, I guess. Always something new to learn, though. I'd call that a feature all of its own. 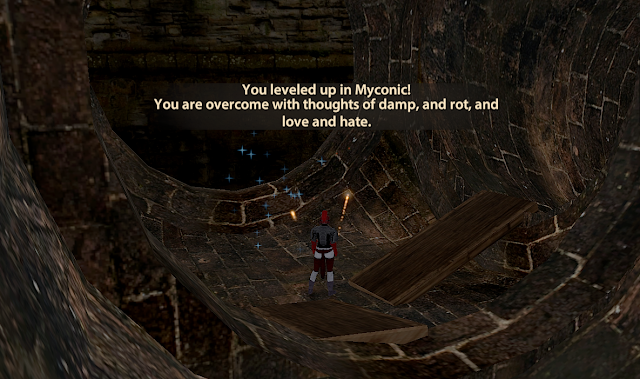 Back when I used to make a character on every new EQ server that rolled by, I prided myself on being able to bootstrap from abject poverty to very comfortable thank-you in a handful of sessions. That seems like a very long time ago. These days most servers have some form of hyper-inflation and all the real market movers count their wealth in Kronos not platinum. And anyway, I have no idea what's valuable any more. I used to make a lot of money going through the bins buying back potentially valuable items players had sold to vendors but I can't parse vendor stock for value at a glance the way I once could. Still, there are ways. A good one is to take a look at what players are selling in The Bazaar - particularly what they're buying on the /barter system. You can set your character up as either a seller or a buyer. Almar has a guide on how to do it but you need to be an All Access member (aka subscriber), which, on the account I'm using on Vox, I am not. Doesn't matter. I don't want to set up a vendor. I just want to know what to look out for so I can sell it to whoever's buying. I got fed up of sitting and medding so I claimed the mount from the Echoes of Faydwer expansion. It's supposed to be a warg but it looks more like a pig with a lion's head. A green pig. Only a fraction of the number of players buy compared to those who sell but you don't need many. Today on Vox there were 68 vendors and 13 buyers, which is actually a higher ratio than I'm used to. I spent a while perusing the buy offers. Mostly crafting materials. Always is. 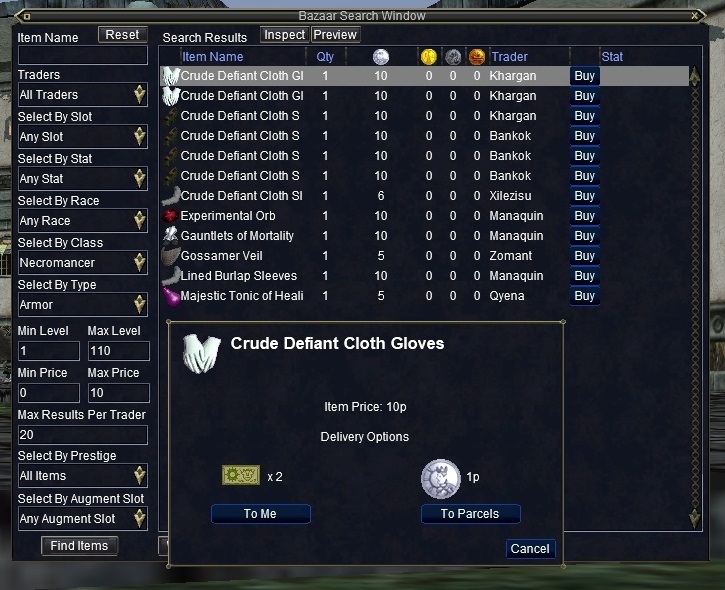 A few people looking to buy Defiant armor on the cheap. The odd specialist request for weird rares. It's interesting how many things have held value and interest. I was making coin selling odd gems like Taaffeite and Harmonagate a decade ago and they're still in demand today. Even older than that, apparently you can still make money farming Iron Oxide and Permafrost Crystals, something I remember doing even before the Bazaar existed, when you had to do your trades in the EC Tunnel or by the Freeport bank. Nothing I had on me was on the list and a trawl round the vendors in The Bazaar and Plane of knowledge only turned up a couple of pieces of Crude Silk and a Crude Animal Pelt. Still, that got me forty plat, which was a start. A start that needed a stop. I'm very wary of getting sucked into the "must check all the vendors" cycle again. Mrs Bhagpuss and I fell so far down that rabbit hole at one time we had to quit EQ and play something else for a while. I try to keep my vendor diving casual nowadays. You know the boats are running again, Sedina? Wait, never mind - just port me! The player economy may have moved on but there were always a few classic ways to make money for spells and gear at low levels that didn't involve trading. One of my favorites was hunting Willowisps for their Greater Lightstones. GLSs are extremely good low-level loot in their own right. They sell to vendors for around four platinum per. Regular Lightstones sell for just under a plat. Rather than selling them straight away, though, it always used to be worth hoofing down to the Gypsy Camp in North Karana, where Mrysla would swap you a GLS for a Concordance of Research and then buy the Concordance back for twice what she'd pay for the Greater Lightstone. It's a wonder she wasn't kicked out of the Gypsy Union years ago. I remembered all that without having to look it up. I also remembered where wisps can best be hunted and that Level 12 pets can "hit magic" - essential since wisps are immune to normal attacks. 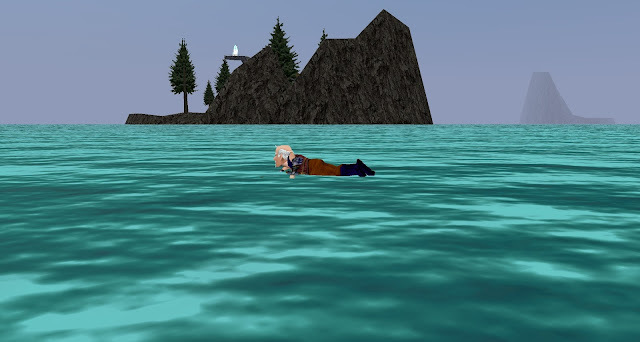 I hunted wisps in Qeynos Hills until I needed to sell, then I went through Qeynos to the docks to take the boat to Erud's Crossing. There was no need to wait for the boat, alhtough I later saw it pass the docks. The Translocator Gnomes, who were added as a "temporary" fix, way back when the boats first began to misbehave in the early 2000s, are still on the job, porting on request. I zapped over to the rock we used to call "Wisp Island" because it was where we'd go there to farm them. It looks a lot nicer in daylight. Also fewer zombies then. After a while I had as many GLSs as I could carry. I gated to PoK and went to The Nexus to catch the portal to the wizard spire. It fires up every fifteen mniutes. I checked and even in 2018 that seems to be the fastest way to get there. I'm noticing a lot of small quality of life improvements that would have made things so much easier back in the old Luclin/PoP days. The Nexus Scions now have descriptive names that tell you where they're going to send you and all the spell vendors tell you which level spells they sell. There's loads of stuff like that. Or maybe there always was and it's just my settings that have changed. I do tend to play with all information switched off but on Vox I'm mostly still using the defaults. One thing that has definitely changed and not for the better is Mrysla. Someone has finally clued her in to the reverse-scam she was running on herself. She now pays exactly the same for the Concordance as she does for Greater Lightstones. She may not be making anything but at least she won't go bankrupt. I googled this to see if I could see when it changed but every reference went back a few years at least and all claimed she paid double for the Concordance. Well, she doesn't, so it's probably not worth lugging the things all the way to the back of beyond any more. You do get some decent xp for handing them in so it might be worth the trek if you're leveling. Otherwise I'd just sell your lightstones where you get the best price and save yourself the trip. What do you mean it's the same price?! I came all this way for nothing??? It's a dangerous journey, too, at low level. I had to avoid griffons and Hill Giants, some of which path right through the gypsy camp. 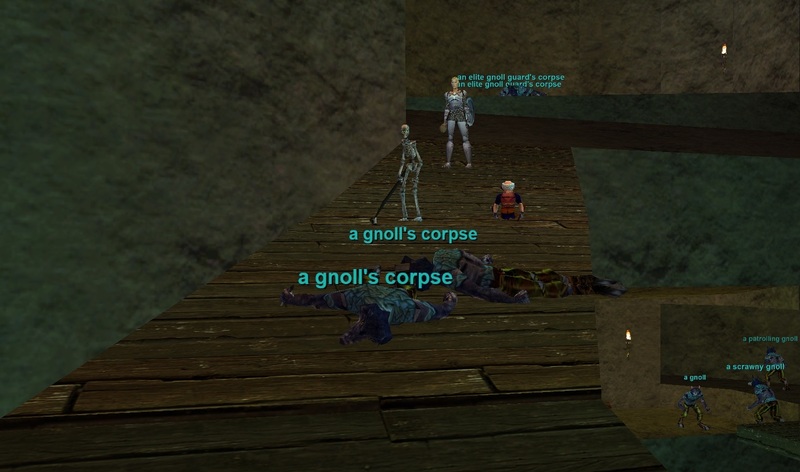 Classic EverQuest. Luckily as a necro I have Gather Shadows, which, in another quality of life upgrade, no longer fades randomly but always runs its full duration. Or maybe it doesn't. I don't know. I've used it a load and it hasn't dropped. Maybe I'm just lucky. It's very difficult these days to find accurate, current info on EQ because the signal is lost in all the noise from the game's long history and, especially, from P99. Then, EQ was always a mystery. For years nothing was documented and now even when it is I don't always believe it. For example, we always used to believe that some wisps were massively tougher than others but we never knew which or why. I noticed today that I could clearly see the buffs on wisps in North Karana and some had none at all while others had Heroism and Symbol of Marsan. These are Level 52 and 54 Cleric spells respectively. Maybe there's some NPC that buffs them. I know I got charmed by one of the Gypsies in North Karana once, who then set me on some unfortunate player. NPCs have minds of their own in Norrath - or they used to. I thought it was all meant have been toned down but maybe not. 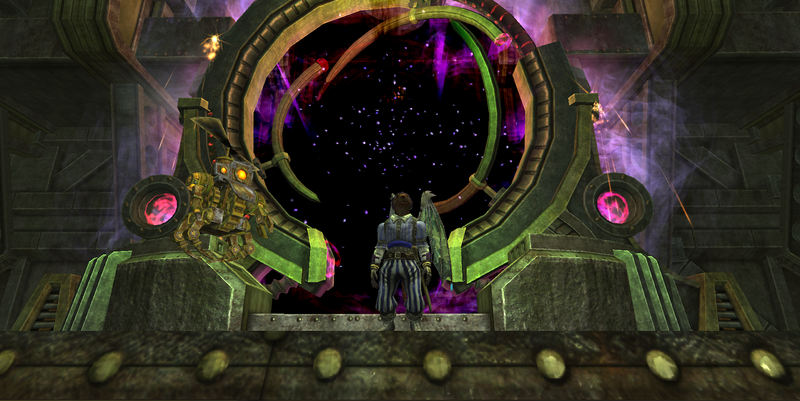 And...this is why I love Norrath. Weird stuff happens all the time. You never really know what's going on and even when you think you do, often as not you're just fooling yourself. .
Level fifty cleric buffs or not, I managed to kill my wisps. I have a pocket cleric of my own, thankfully, or I would have had to run them across the bridge to East karana. Mercenaries and Defiant armor make the low/mid level game a playground not a purgatory these days. 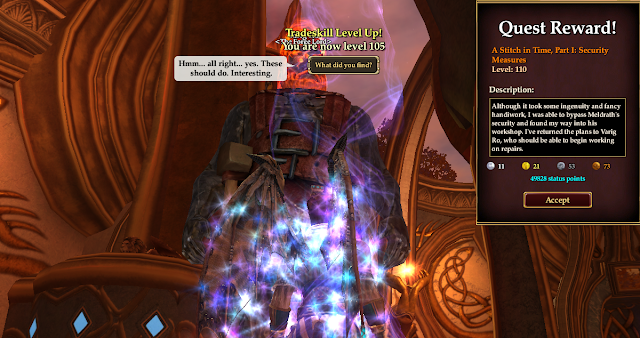 I'm about half-dressed in Defiant now and at Level 14 I have six more levels before I need to think about upgrading. At the rate I'm going that should be sometime on Thursday or Frday. Whether I'll carry on after that, who can say. I'm having a heap of fun right now, though, so maybe I will. If I do, I'm going to need to come up with a better money-making scheme than selling Greater Lightstones for union minimum. Any ideas? Super-annoying busy work schedule means no time or energy to post. Worse, there's been quite a lot of stuff going on I'd have liked to post about. No point pretending that's going to happen but hey, this is an MMO blog. All I have to do is wait a while and all the same topics will come round again. And again. And again. That's pretty much how my gaming is right now, come to think of it. Every day this week has been the same: GW2 dailies on three accounts, followed by a bit of a runaround in WvW, if there's a good Commander tagged or an enemy zerg's threatening one of our keeps. Then it's over to good old EverQuest for the last hour before bed. 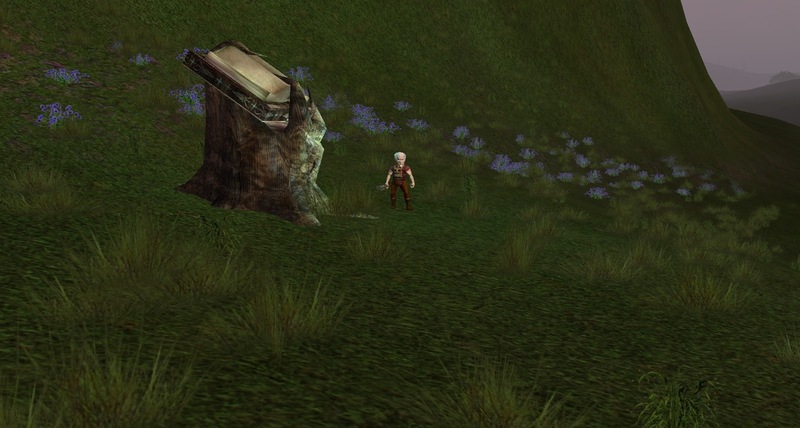 Thanks to all the publicity about the 19th Anniversary and having to log in to take some screenshots for my post about it, I somehow found myself leveling a Necromancer on Vox. And loving it. EQ is insanely relaxing. It just is. I'd forgotten how much. Coming home from work, too tired to do anything that demands urgent movement, EQ's stately (some would say funereal) pace is exactly what I need. With the current 1.5x XP bonus, an hour is just about right to get to Blackburrow, do a level, then Gate to Plane of Knowledge, sell my loot, buy my new spells and camp, ready to do it all again the next day. No doubt things will slow down in due course but I dinged 12 last night and I was still trucking along happily. Vox seems like a delightful server - a lively, chatty, good-natured crowd, much more mixed in level than I've been used to seeing in EQ for years. I had absolutely no plans either to play EQ again right now, or to level up a new character, but what the heck...if it's fun, stick with it. That's Tipsy Teena in the red dress. She runs the Aniiversary Naked Gnome Races. Why she's at the chessboard I have no idea. Next thing is to work put how to make some money on a new server. I used to be good at that, once. Baby needs new shoes - and everything else! 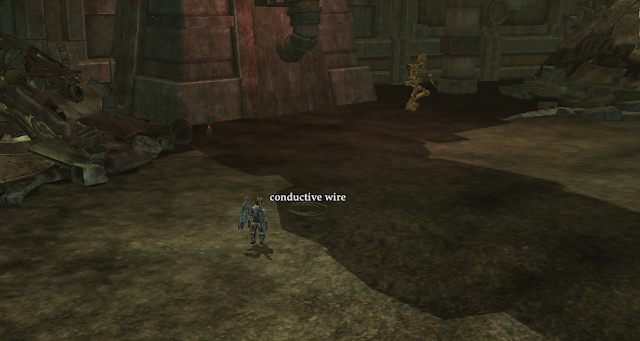 Back in GW2, I did at least manage to clear a very long-standing goal the other night. 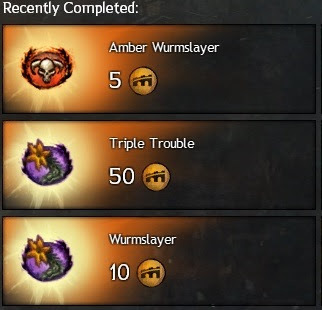 For a long time I've been one Achievement short of the Meta for Triple Trouble, the mega-event that was so controversial when it was added to the game just over three years ago. Back then it was the closest the game had to raiding. Along with the revised version of Tequatl it changed the ethos of the game and not, in my opinion, for the better. Now, of course, we have actual raiding, the horse is out of the stable and away over the hills and there's no point trying to bolt any doors. Anyway, these days Three Headed Wurm is just another map meta so if you can't beat em...er, beat 'em. Which is what I haven't been able to do. Until this week. TT may be on farm status for some but in my experience it still fails a lot even if you join experienced guilds for an organized run. Case in point, it's failed every time I've taken my ranger there for about the last year and a half, although that's probably fewer than ten times in total. I only do it on a whim, when I happen to hear a guild advertizing a run. This time it was [QUTE], who run it most days at 8PM GMT. I've done it with them before and while they know what they're doing the random selection of passers-by they attract generally don't. It looked very much as though it was going to fail on Wednesday night too but somehow we managed to pull things out of the fire at the very last second. I got my 50AP and my title and I never want to do it again. Then again, since I have three accounts, I probably will. But not for a while. Yesterday, UltrViolet of Endgame Viable posted at length about his unfortunate experiences on the new EverQuest progression server, Coirnav. Many of the technical issues he experienced could be addressed and corrected with some research and a few tweaks to the settings but the probems he encountered with the gameplay itself are perhaps less tractible. What struck me most was the way parts of his report could have been lifted verbatim from the complaints of a frustrated new player c. 1999. I suppose that could be seen as an endorsement of Daybreak's efforts to replicate the authentic, original EQ experience. What puzzles me a little is that anyone would want to recreate it to begin with. As someone who was there at the time I have long believed that the huge majority of the many, many changes that SOE and later DBG made to the game have been very much in the game's own best interests. The way the interface has evolved is a prime example. Modern EQ (if that's not a contradiction in terms) has one of the most flexible, customizeable and comprehensive front ends in the genre. You can move and resize every window, change the font and the colors, create new chat windows and channels. The whole system is fully moddable. Typical gnome. Even the mercenary has to pose. Some aspects, like the loot system, are significantly superior to anything available in any other MMO I've tried. There's a fully fuctioning quest journal and a quest overlay to track objectives. In-game maps are standard and you can install custom maps like the ones Keen recommends from Brewall if you want even more detail. Because of the age of the engine some of those facilities are a little...idiosyncratic but modern EQ has all the conveniences MMO players have come to expect over the two decades since the original game appeared, crushed into a small square at the center of your 14" CRT monitor. Why anyone would want to go back to basics when so much has been improved beats me. It's a bit like building a mansion and insisting on living in the basement. If you read the MMO news sites and follow the blogs that still mention older games, you'd get the impression that my view was an anomaly. Apparently what everyone wants is a time machine to take them back to the dawn of the MMO era. Trion is only the latest developer to jump the nostalgia train - quite effectively according to some reports - and of course we have Classic WoW (Official) to look forward to, always assuming we live long enough. 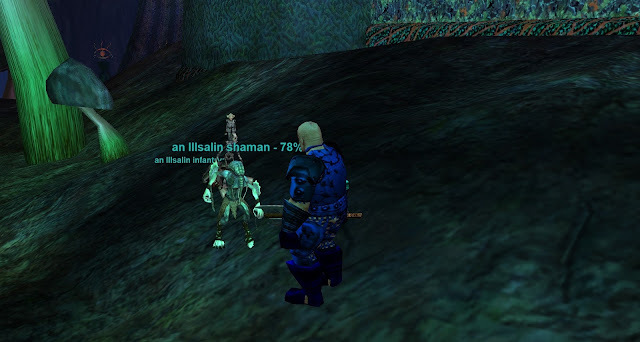 Even so, I was somewhat surprised when I logged into EverQuest this morning. No, I wasn't making a character on Coirnav. Been there, done that, using the tee shirt for a duster. I knew DBG had been making a habit of starting new progression servers but I hadn't quite realized just how far it had gone. Five of the six "preferred" servers use some form of Progression ruleset. There's even a sixth, the original Fippy Darkpaw, which is no longer preferred and sits below the line in "Standard", although, as I just confirmed by trying to log in my only character there, it still requires a subscription. 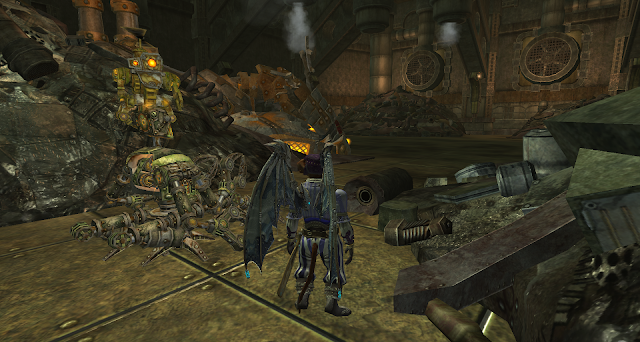 It's also dead as dead can be, as I discovered when I created a new character using my All Access account to check. I made a gnome, ran to the PoK book in Steamfont and zoned into Plane of Knowledge. I was the only one there. I'm not sure I have ever been the only one in PoK, not even after a server crash. I tried the Guild Lobby. Empty. The Bazaar. No-one. As best I could tell I was the only player on the server. Eventually someone else appeared and I asked them if it was always so quiet. Yep, they said, it is. So that's the ultimate fate of the progression server, just in case were you wondering. Is there really a market for six timelocked/prog servers, covering overlapping eras, all running at once? You wouldn't think so but then who'd imagine a 19 year old MMO would be able to support twenty-two servers in the first place? Well, DBG, apparently. And it seems they're right. Most of those servers have been around for a long, long time but even excluding the nostalgia circuit, a couple are relatively new. Vox started in 2012, when EQ went Free to Play (Your Way) and Brekt, a server whose name I had never even heard of until I logged in today, began just last year. Fippy Darkpaw Guild Lobby. I own it. I couldn't find much about Vox from this year but according to Reddit and the forums the server was still thriving in 2017. You shouldn't believe everything you read on the internet, though, and following my Marie Celeste experience on Fippy I thought maybe I should double-check. It so happens I have a character on Vox so I logged him in. He was a level 1 Cleric, camped out in the suggested starting zone of Crescent's Reach, the newbie area from The Serpent's Spine expansion. I have no memory of creating him and he doesn't seem to have been played. (Just for the record, it transpires that I have two more characters on Vox, on the account that used to be subbed. Both of them have been played somewhat, a Level 3 Paladin and a Level 6 Necromancer, both gnomes, of course. I have absolutely no memory of creating, naming or playing either of them. I have far more characters in EQ than I could ever hope to remember). When I logged the cleric in there were sixteen people in the zone. Sixteen! I haven't seen that many people in Crescent's Reach for a decade. 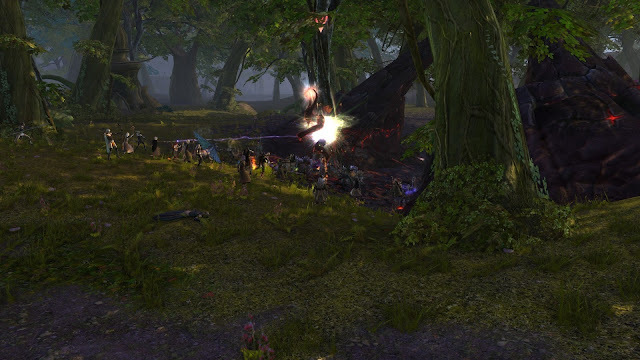 I ran him to the book in Blightfire Moors and zoned into PoK, where there were just under fifty people. Not bad for the time of day. The Bazaar had over eighty traders. The real shock, though, was the Guild Lobby. There were just five people there, including me. The weirdly obscure PoK book in Blightfire. By comparison, when I log into my regular server, Luclin-Stromm (if you can call a handful of times a year "regular") there are usually something like three to four hundred people in those three zones combined. That's down from maybe 500+ five years ago but it still feels very busy. The key difference is, I think, in their levels. On Vox the levels in my Plane of Knowledge search result stretched from the low teens to the level cap, with a good representation across most of the range. On Luclin or Saryn or Tunare most of those would be max levels; in the dogpile in The Guild Lobby, virtually all of them. The appeal of The Guild Lobby is that it's where everyone afks to get MGBs, because it used to be the only public zone where buffs didn't expire - although now they also last forever in Plane of Knowledge, I believe. That's very much an end-game thing, though, and it seems Vox is not an end-game focused server. For comparison I also logged into a couple of servers where I have characters I haven't seen for a while. Bertoxxolous-Saryn and Tunare-Seventh Hammer. They were both busy enough - fifty to eighty in PoK, eighty to a hundred in The Guild Lobby. I didn't go in The Bazaar. There's only so much random zoning I can stand. Enough with the research. Since I'd logged him in, I thought I'd give my old Ogre Shadow Knight a run. When I talk about my glory days in EQ, plenty of them were spent playing that SK, although nowhere near as many as on my Cleric or Beastlord. 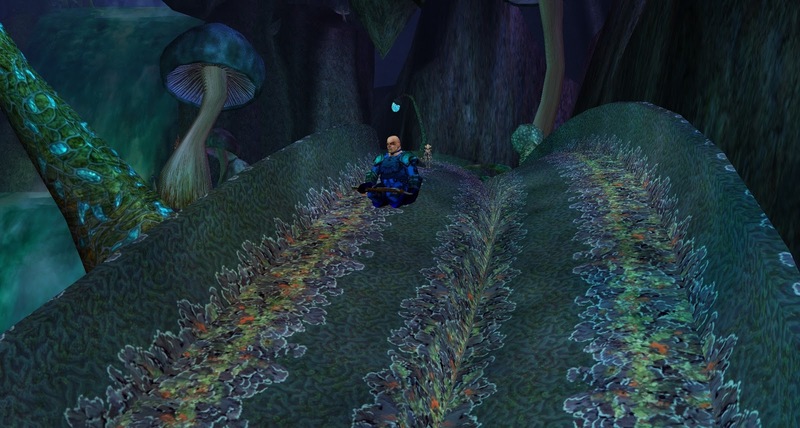 I grabbed Franklin Teek's task for level 60, so as to give myself an easy ride, and headed to Undershore. Adds. We can handle them. The SK was about three-quarters of the way into Level 65 when I got there. When I left, about ninety minutes later, he was 12% into Level 66. By EQ standards that is lightning fast soloing. I was very pleased. Undershore is a Hot Zone, there's 1.5x XP running on the server for the Anniversary and I popped my Lesson of the Devoted for another half hour of +100% but even with all that I wasn't expecting to ding, let alone get safe, as we used to say. It was nice to find I still remember how to play an SK but not so much to remind myself it's still as slow and repetitive as it always was. Some classes are a good deal of fun to solo but I never felt SK was one of them. It's kind of like being a Necromancer with the power switched off. Tanking for a group I always enjoyed, even if it was often stressful, but soloing or even duoing as an SK tried my patience back in the day. It's much, much safer with a Cleric Mercenary alongside but it doesn't get any more interesting. At least he doesn't have to fear-kite so there's that, I guess. All things considered, I had a lot of fun dipping back in, visiting some old characters. Partly it was the investigation. I've been watching a lot of Scooby Doo: Mystery Incorporated recently and all that looking for clues about population density really hit the spot. The gameplay itself was something of a bracer, though. I'm not at all surprised UltrViolet found it hard going, particularly on Coirnav. As Gnomenecro observes in the comments, Progression servers really are only suitable for veterans who already know the ropes or people who have a willing vet on tap to hand-hold them through the difficult early stages. Medding still a thing, I see. Wilhelm is also correct that for most people it all hangs on whether you find a group you enjoy hanging out with before it all gets to be too much trouble and you quit. It's that shared experience, often first encountered at bandit (or dervish or orc goblin or kobold) camps or in one of the first open dungeons like Crushbone or Blackburrow, that turns a few confusing, frustrating, lonely hours into an exhilarating, amusing, entertaining session you can't wait to repeat. For anyone new, hoping to have the kind of good times devotees like Keen can apparently turn on at will, I would advise staying well clear of Coirnav and the rest of the Progression servers. I'd suggest making a character on Vox, where you can play for free. Do the Mines of Gloomingdeep tutorial (I loathe it but I don't for a moment question its worth for a genuine first-timer) and then head to Crescent's Reach, where on the evidence I saw today there will be enough new players to make the place feel lived-in. 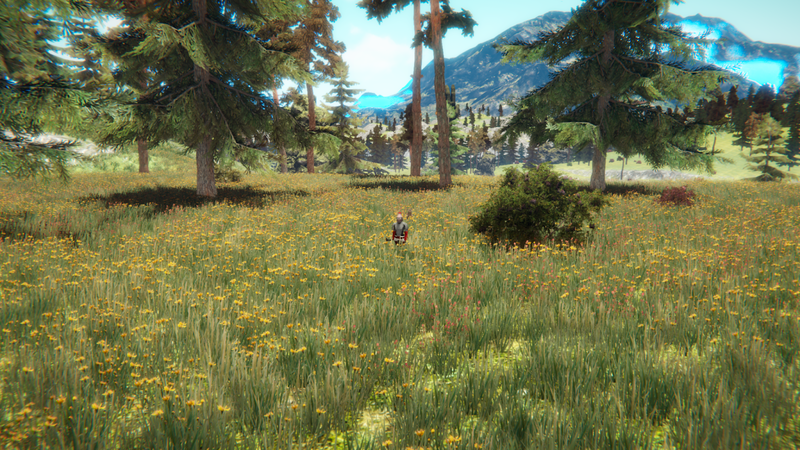 From there, follow Almar's excellent guides or just use the in-game Zone Guide to find level-appropriate hunting areas. Solo if you enjoy it - I always did. I recommend playing a pet class - necro, mage or beastlord - for solo fun but with a mercenary anyone can solo these days. I guess if you really hate other people you could always sub and play on Fippy. Pretty much have your own private EQ right there. As Wilhelm says, though, if you want to make friends fast you can't do much better than a druid. Everyone loves SoW, even in 2018. If you find going it alone tedious or difficult, start grouping. It's never too soon, although not a lot really happens before you hit double figures. You can have a lot of fun at a kobold camp at level 5 if you run into the right people, though. Give EQ a chance to get its claws into you and it will never let go. Nor will you want it to. Just don't make it harder than it needs to be by throwing your lot in with the "it was so much better in the olden days" crowd. It wasn't. It's better now. 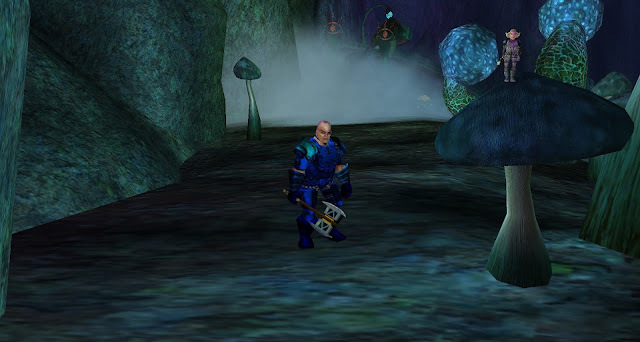 When I sat down at my PC yesterday morning, after a Sunday morning walk in the snow, I hadn't planned on writing about EverQuest's 19th anniversary. 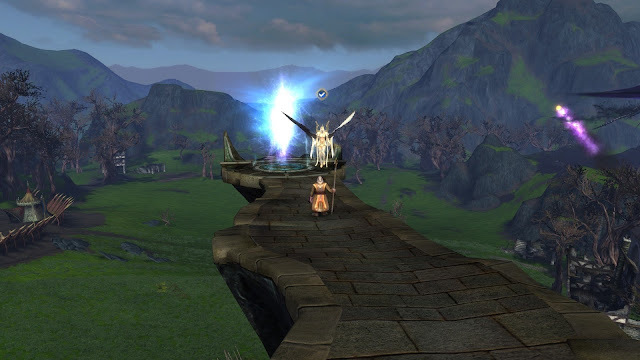 I was going to mention the new holiday events in the EQ2 Producer's Letter, then go on to use the soft reveal of this year's expansion to segue into a post about Planes of Prophecy. EQ2 expansions have fallen into something of a pattern for me over the past few years. I pre-order the standard edition as soon as it becomes available then, when it launches, I take my Berserker through the solo Signature storyline. That usually lasts me two or three weeks, playing maybe a couple of hours some evenings and a few longer sessions at the weekend. My Berserker is also a Weaponsmith so once the Adventure line is complete I turn to crafting. There's always a Signature tradeskill quest of roughly equal length although I tend to find that I can finish it in half the time or less. After that I usually take a little break and log in less often, although that's not really in my own best interests. Over the years, Daybreak has become quite clever at including content with attractive rewards for logging in regularly. They are much more subtle about it than most developers. There's a perfunctory set of dailies that give Veteran rewards but mostly there are a whole lot of well-integrated, lore-appropriate tasks that increment every day or so, along with some that take days or weeks to mature. Oh look, it's the ghost of Meldrath's hitherto-unknown twin brother! I think we must be in the Brazillian soap opera dimension! Every day my Weaponsmith and my Sage get to harvest a bush they received at the end of the Signature tradeskill quest from the expansion before last. That gives them each a load of crafting materials including a guaranteed rare. 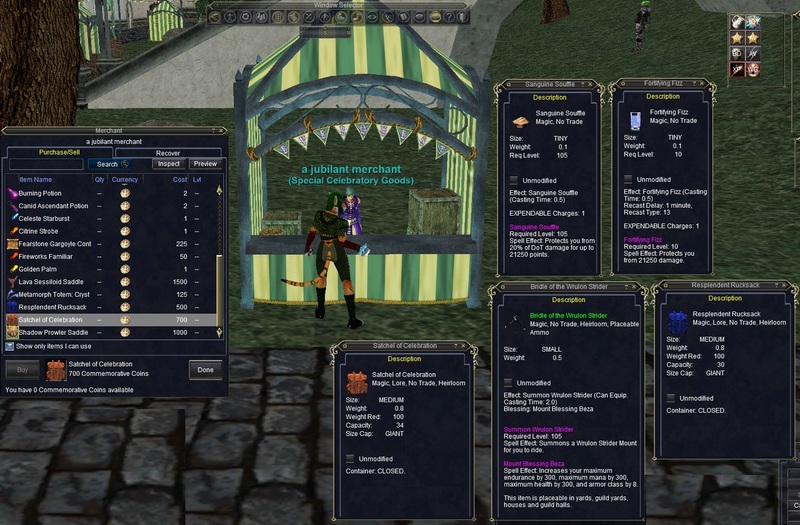 Crafting rares in EQ2 are genuinely rare and genuinely valuable so a free one is not something you want to miss. Each day every character can visit a trainer to get a scroll that goes towards leveling up their Ascension class. There are four of those classes and they currently go to Level 15. The abilities they provide are immensely powerful and there's an even bigger synergistic bonus for leveling them all. Then there are the spell assistants from expansions deeper in the past. Both my high level crafters still visit the badgers living in their houses to check on the progress there, although these days those recipes probably aren't of all that much practical use or value. Those are just the ones on my personal "to-do" list. I'm sure there are others. It's a big game and I don't by any means know all the ins and outs these days. When the wiki tells you not to bother with Track Materials for this stage, ignore it. This stuff is hard to spot. The really smart design here isn't just giving us so many plates to spin. It's the way all these activities draw you into the world. You can't just log in, grab the instant reward and log out, the way you can in so many MMOs. 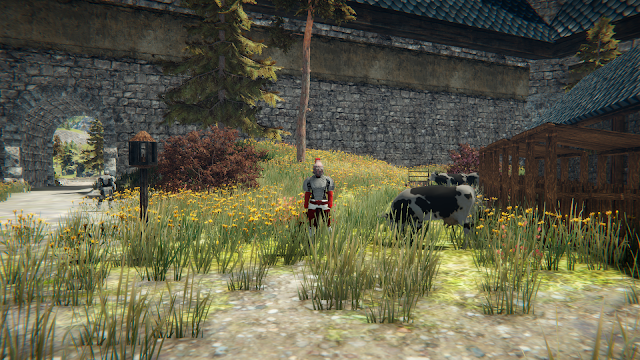 If you want the good stuff you have to go to a specific location and intereact with an NPC or an object. You could consider that an irritation and I'm sure many do but it also grounds the player in the game. You don't get much unless you play for it. That said, there are some timegated activities that can be handled directly through the UI, wherever you happen to be. Training your Mercenary, for example. It's a simple process - just click on their training schedule then forget about it until the training is done. Only, that can take several days and the clever part is that it doesn't automatically move on to the next level. You have to manually select the next step. It's fire and forget except you have to remember to reload. The system that allows you to upgrade your spells and abilities works the same way. 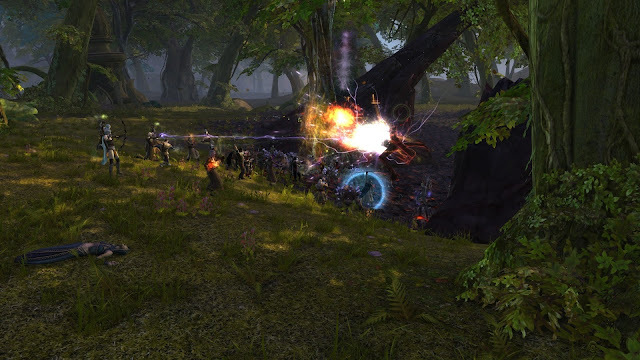 EQ2 nowadays has a ferocious depth and range of spells and spell-like powers. When the game started the upgrade path for each individual spell or combat art went Apprentice/Journeyman/Adept/Expert/Master. (Actually it was a lot more complicated than that but all the interim sub-levels were removed so let's just pretend they never existed). Don't look at me, I didn't break it. Him. Them! These days there are two additional grades - Grandmaster and Ancient. If you want the very, very best spells you'll need a raid drop but everyone can have all their abilities at Grandmaster...if they log in often enough. Taking the time and trouble to keep all your free spell upgrades ticking over on all your characters makes a very signifcant difference to their power levels and effectiveness. It also saves you a ton of money when compared to just buying upgrades from other players via the Broker or crafting them yourself. A player who logs in regularly and attends to his or her background tasks will be richly rewarded for doing so. It might sound like busywork but I find it engaging and entertaining and even those who don't will certainly find it a valid and justified use of their time. Of course, if all you really want to do is solo or play with friends, none of this is essential. Those Signature lines gear a character up perfectly well for the content and of late the developers have taken to handing out catch-up kits for free so returnees or newcomers can keep up. Still, if you can maintain your routine it really helps. When the Path of Prophecy expansion launched last year the signature tradeskill quest wasn't ready. It finally arrived in game a couple of weeks ago but I didn't get round to starting it until this last weekend. The walkthroughs were daunting. It's a five part quest, with each part reckoned to take a few hours. I did part one on Saturday afternoon. It took me a couple of hours but a lot of that was cross-referencing back to the wiki or EQ2Traders to make sure I was doing it right. There was a lot of cut-and-pasting of locs, too, which always slows things down. It was a lot of fun. All those times I harvested my bushes helped a lot. I had all the necessary materials ready. The combines didn't seem to be anything like as long and troublesome as I'd heard. The zones were easier to navigate than expected. The puzzles were straightforward. The unkillable mobs were easy to avoid. I did die twice but both times it was because I hadn't paid sufficient attention to the instructions. My Weaponsmith had full vitality (100% bonus xp) when he began and the server was giving another 100% bonus for the weekend. I went from Level 100 to Level 105 just on part one alone. I'm very confident now of being able to take my Sage through without worrying about leveling his Adventure class to 110 first. Getting his crafting up to speed is quite important. As a level 110 Sage, he'll be able to make Expert spells using the free rares from the bush. Having Expert spells scribed then allows him to upgrade straight to Masters using the free, time-gated system. Oh, very amusing. An actual "time gate". The whole thing fits together seamlessly. It's a very satisfying, elegant arrangement. The only problem is, I no longer have access to a max-level Alchemist to make the Expert combat arts for my Berserker. I used to rely on Mrs Bhagpuss's Alchemist for that, which worked fine even while she was no longer playing, so long as the level cap was stuck at 100. Not any more. This is where that mildly controversial Level 100 Tradeskill Boost could come in handy. It's pricey at 3500 DBC but I have plenty of funny money saved up. The alternative would be to buy the expansion for Mrs Bhagpuss's account and level her Alchemist up but that would mean spending real money. Or maybe I'll just level up the old-fashioned way. It's a grind but every writ gives status and status levels the guild. Another clever integrated system. This month marks the nineteenth anniversary of the launch of EverQuest. Unlike Wilhelm, I can't claim to have been there on day one. I turned up fashionably late to the party some eight months later, just after the game's first major live event, Bloody Kithicor. At least, I think that's what happened just before I got there. It's surprisingly hard to find the details nearly two decades on. Even the invaluable patch archive at Allakhazam is, well, patchy when it comes to that first year. When you come to think of it, maybe a few gaps in the record aren't so surprising after all. I vaguely remember reading an interview with John Smedley that he gave not long after launch, where he estimated something like a three year lifecycle for the new game. Five years if things went even better than they dared to dream. Certainly no-one back in 1999 was expecting the game would still be around nearly twenty years later, far less that it would still have enough traction in the marketplace to justify the production of annual expansions and the creation of new servers. And yes, Daybreak is celebrating the anniversary with yet another Progression server; Coirnav. Just how many retro-fitted new beginnings can one game stand? DBG have taken so many bites at this particular cherry they must be gnawing on the stone by now. You'd think there'd come a time when diminishing returns would kick in, especially with the quasi-authorised Project 1999 always available for an even more authentic old-school buzz. If so, it seems that time is not yet. I have no plans to play on the new server. I barely play EQ at all at the moment but if I did I'd probably do a bit on my 94 Magician while the bonus anniversary xp is running (until the end of March). I was briefly tempted but it's not even double xp, just 1.5x and that's not going to make a huge difference at the glacial leveling speeds of the mid-90s. 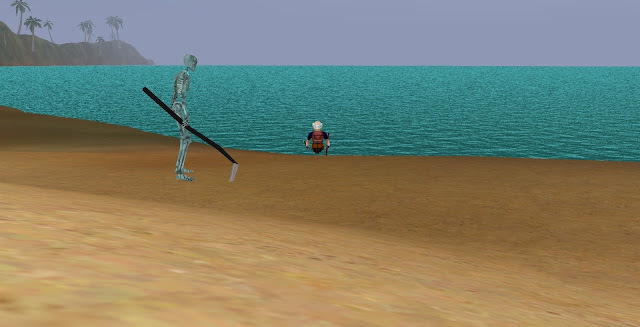 Even Keen, possibly the purest EQ loyalist still blogging, almost had to talk himself into starting over yet again - but there he is, heading back to Crushbone once more. He commented a while back, when he was debating with himself whether or not to return to Norrath for the umpteenth time, that his brother was less than impressed: "...when I told Graev I was going to play again he gave me the sourest look of disgust and said, “Isn’t it time to move on? After 20 years don’t you think it’s time to play something else?”"
Well, maybe. In Keen's case it's not even a case of going back to play through the whole game, just a very, very small subset of EQ's vast and sprawling empire of content. Really, though, as Jeromai said in a comment to yesterday's post, "I like comfortable, thank you. It makes me happy." If you find something that works for you then work it, why not? Even though I don't want to level another character uphill both ways in the old-school snow or grind more thankless upper-tier tasks for Franklin Teek, I might just pop my head around the door anyway. Looking at the Producer's Letter, there's quite a lot going on besides the new server and the bonus xp. I note, for example, there are four new Anniversary-themed missions, "Depths of Darkhollow and Mayong Mistmoore-themed!". Just a few of the many items available from various anniversaries. There's some very useful stuff here, from food and drink that would offer major twinkage at low levels to 30 and 34 slot bags that would be welcome at any level. Also, up in the top right corner, a new window with clickable icons that promote a whole raft of Anniversary events. I have fond memories of the Depths of Darkhollow expansion; it was, I believe, the last one Mrs Bhagpuss and I played together, at level and at time of release. I wouldn't mind poking around in those subterranean caverns again. 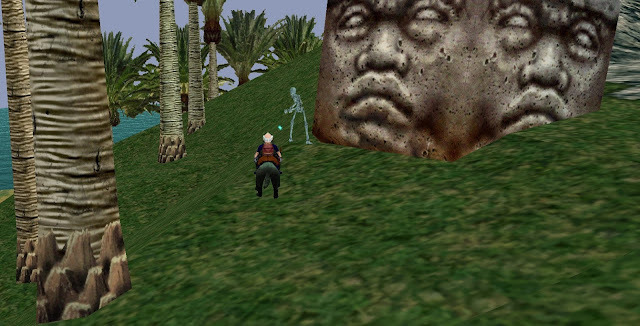 And anyway, there's so much more to EverQuest than Vanilla/Kunark/Velious. Some of the mid and later content is a match for any of that Golden Age stuff. I mean, you don't keep thousands of players for almost twenty years purely on nostalgia...do you? With expansions in mind, there was some welcome news in the most recent EQ2 Producer's Letter. It may only be March and everyone playing may still be heavily invested in the most recent expansion, Path of Prophecy, but EQ2 Producer Lauren “Mooncast” McLemore confirms Daybreak is already working on the next: "Last, but not least… expansion! It’s already in progress, but you’ll need to wait a bit longer for more details!" I'm not sure I can remember an EQ2 expansion being confirmed quite this early in the cycle. It makes me wonder, with the crash-and-burn of major DBG moneymaker H1Z1, whether some more resources and attention might not go the way of the two Norrath titles this year. 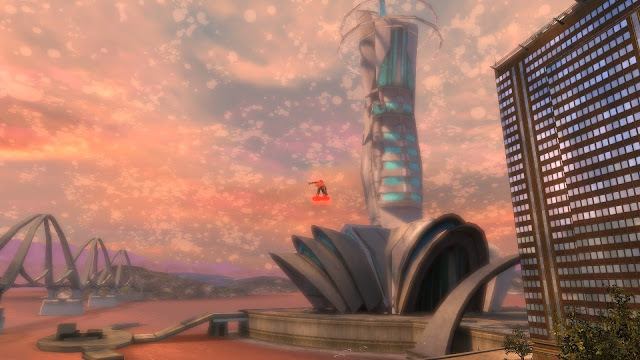 DCUO seems to be humming along very nicely but other than that the EverQuests might be where Daybreak's fortunes rest right now. He wouldn't give me his quest. None of the 19th Anniversary NPCs would, although they were all quite willing to chat to me. It seems this year's offering requires ownership of the current expansion. Never mind - I still haven't done most of the quests from the last half-dozen! As well as confirming the expansion, the Producer's Letter contains another surprise: EQ2 is getting two more holidays. As I may have mentioned before, EQ2 already has more holiday events than just about any other MMO I have ever played. Niami Denmother made the point when she observed only a few days ago, as she prepared to test three upcoming Norrathian holidays, Beast'r, Chronoportals and Bristlebane Day, "Lots and lots of event overlap this year!". Well, we can add two more to the calendar. This summer sees the addition of The Oceansfull Festival and the Scorched Sky Celebration. Which is wonderful. I'm always up for another holiday. Just so they don't clash with Tinkerfest, that's all I ask! 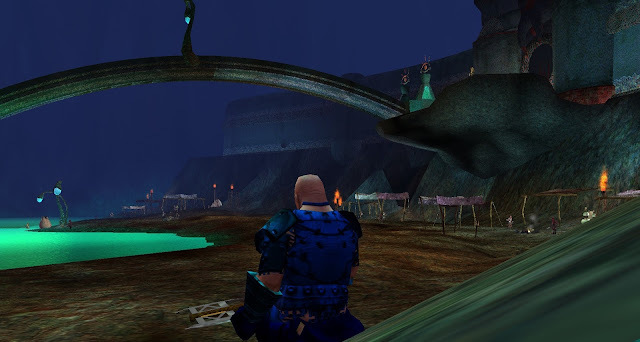 EQ2 turns fifteen this year, which is one heck of a milestone for an online game but next year is the big two-zero for EverQuest. The media absolutely dote on round-number anniversaries so it could offer a major P.R. opportunity. It might even earn the game some coverage outside the gaming press if DBG play it smart. And wouldn't the twentieth anniversary be the perfect time to announce a new EverQuest title? Something a little more realistic and pragmatic than the wish-fulfilment fantasy that was EQNext. Something that might actually get made. And played. "The action of driving somewhere is much more involved than watching the screen – there are thousands of more individual choices and reactions necessary to drive somewhere safely. But is it more engaging? At the end of the night, which do you remember more?" At first blush I thought this summed up the situation brilliantly. For many people, learning to drive is a complete pain; stressful, difficult and sometimes it seems to take forever before things click into place. Once they do, however, there's a surprisingly swift and often sudden transition to thoughtless facility. Almost without noticing, you move from concentrating ferociously to the whole thing happening almost automatically. Even more so if you do, in fact, drive an automatic. It's an appealing metaphor for the experience of learning to play a game that uses "action rpg" controls - usually a combination of hammering left/right mouse button and a handful of Function keys. The more I think about it, though, the less sure I am of its fundamental truth. I should admit up front that I'm hardly in a position to judge as far as action games are concerned. I have never reached that autonomic stage, where my conscious mind no longer has to deal with the controls. I know exactly how that feels in driving, though. I can even pinpoint the specific moment when the transition occurred. My brain in an action rpg. I had two goes at learning to drive. The first time was when I was eighteen. Unlike many teenagers, I had no interest in driving, but my mother was positively evangelical about it, believing driving to be an essential life skill. I let her pay for me to have lessons, mostly to get her to stop chewing my ear off about it. I took my test, failed, told her I'd done my bit, then went off to a University whose rules dictated that students were forbidden to own or operate a car anywhere in the city. That suited me fine. I forgot all about learning to drive for a decade. Ten years later, aged 28, I found myself going out with someone who believed it was a cardinal rule that anyone who rode the bus after age 30 was a failure. It was the 80s - what can I say? I didn't subscribe to that theory, then or now, but I did once again subscribe to not having my ear chewed off if there was something I could do to stop it. I took some more lessons, took my test and this time I passed. Very soon after that the relationship ended. With no more motivation to drive, the day I took my test was the last time I sat behind the wheel of a car for about five years. Fast forward to the early 90s and my first ever foreign holiday with Mrs Bhagpuss. For reasons that are now lost in the mists of time we decided to fly to Lisbon and hire a car to drive into Spain. I had, at this point, never driven a car for any other purpose than taking a lesson or a driving test, far less driven a strange car on the wrong side of the road in a foreign country. It was the 90s, what can I say? It's all so much easier in the sky. I took a few refresher lessons before we went, just to remind myself where the steering wheel was, and then off we went. It's quite surprising we're still around to tell this story, I guess. Actually, it's quite surprising I got the car out of the airport car park. What did happen was revelatory. Somewhere on the long, straight, quiet multi-lane highway that runs along the south coast of Portugal into Spain, I became a Driver. I left Lisbon in a sweat of concentration and terror and crossed the border in a state of calm control. Ever since then I have been able to drive. I'm not recommending it as a method - it's from the "throw them in the deep end and they'll learn to swim" school of thought, I guess - but it worked for me. My action gaming has never enjoyed such an epiphany. When I play DCUO or Neverwinter I still have to concentrate on the controls. I never get to experience the game directly, only me playing the game. 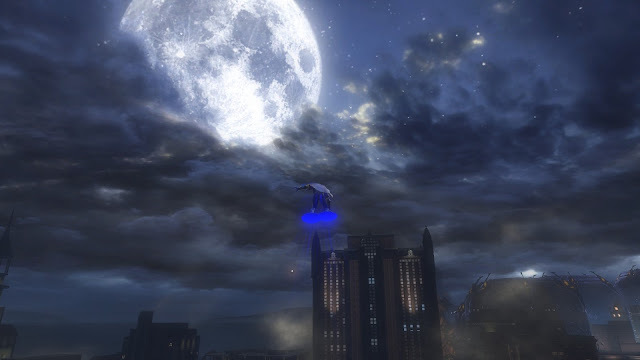 I'm comfortable enough with DCUO in particular that it's not offputting or unpleasant, but it's a good way from Azuriel's "just like with driving, I kind of zone out the experience when I’m killing enemies in Action games." So, I can't really speak to the accuracy of the analogy from personal experience. But even if I could, I see another flaw: I really, really love driving. From the moment those pieces fell into place back on that Iberian highway I have found the process of controlling and moving a vehicle to be a pure joy. I'm one of those people who sees every minute behind the wheel as an opportunity for entertainment and pleasure. I drive for the sake of driving. I go the long way just so I can have more of it. Almost every holiday we take is a driving holiday and while the scenery and the exploring are a huge part of the attraction, so is the opportunity to just get out there and drive. I can unironically affirm that for me driving to see a movie is often more engaging than watching the movie itself. It doesn't even have to be a bad movie for me to feel that the best part of the evening was the drive there and the drive back. My time with GW2, which is sometimes considered to use a hybrid of traditional and action rpg controls, gives me reason to believe it would be the latter. One of the main reasons I have stuck with GW2 so loyally and so long is the way it feels when I'm driving my characters there. I find the controls wonderfully fluid and intuitive. I love the constant movement and especially the dodging. I fling my characters around as though I'm driving at speed - all the sensation with none of the danger. (It's also the main reason I so dislike GW2's implementation of mounts. It turns my elite sports cars into clumsy, awkward trucks). Whether Azuriel's analogy has universal application or not, it's been very useful to consider. I'm now wondering whether, rather than veering away from games with action controls, I should steer into the learning curve instead. If I could push through the membrane that separates thought from action, would I find myself zoning out in boredom or riding the crest of an ever-breaking wave of exhilaration? Okay, now we've gone surfing. Time to stop. Suffice it to say I recognize that it might be me that's missing out here. Whether I'm even capable of making the transition is another matter. And while we're on the topic of driving, how ironic is it that the one MMORPG whose controls I literally cannot master, even to the minimal level required to finish the tutorial, is The Crew? 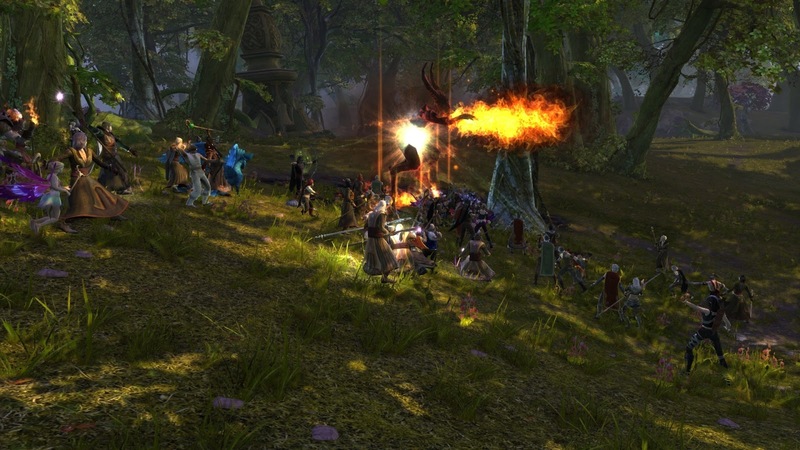 Rift Prime launched last Wednesday, with the traditional log-in queues and lag. Or so I read. I wasn't there. I'd forgotten all about it. It wasn't until Wilhelm posted the day after that I remembered one of the things I was supposed to do on my week off work was decide whether or not to give Prime a try. I was leaning very strongly towards not bothering until he pointed out that the required Patron status is purchasable with Trion's funny money rather than real cash. Like Wilhelm, I'm still sitting on a huge pile of credits from the F2P conversion years ago. In what was the most ill-judged purchase of my MMO carreer, I pre-purchased the first Rift expansion, Storm Legion, in the version that came with a full year's subscription. When Trion later decided to drop the sub they gave refunds...in cash shop credits. That wasn't the ony reason I felt I'd made such a bad decision. There was some odd background to it that I'd like to record here for posterity. Mrs Bhagpuss and I played Rift for around six months from launch in 2011. We had a good time for a while but only a year later we were already playing GW2. Although we took to GW2 immediately, at the time the first Rift expansion was announced, GW2 was having huge - really, really huge - problems with bots. 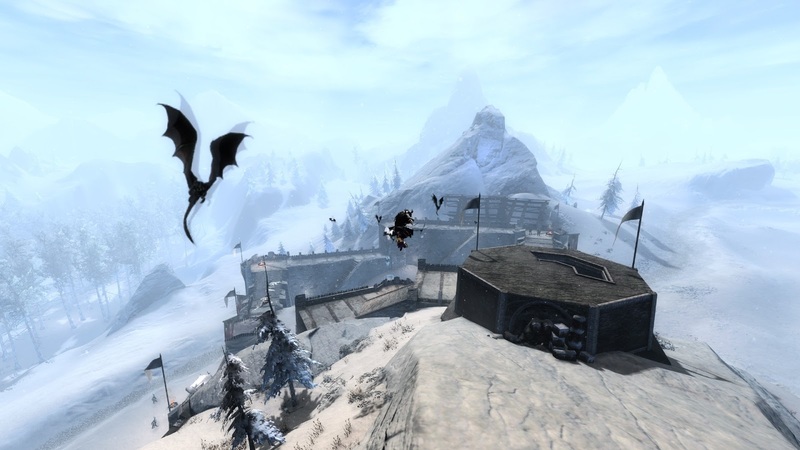 Just a couple of months after launch those issues were so pervasive and unavoidable that we discussed our options and decided that, if ArenaNet couldn't get things under control, we'd quit and go play the Rift expansion instead. So I bought two 12 month packages, which seemed like the best deal. Then we went on holiday to Spain for a week. When we came back ArenaNet had cleaned house. The bots were gone. All of them. It was like magic. I never heard exactly how ANet did it but overnight they either removed the entire population of bots or made it so we never saw them. In a matter of weeks it went from being the number one issue that threatened to destroy the entire game to something no-one even mentioned. Now the whole episode is utterly forgotten. So there we were, with a year-long sub to a game with a new expansion and no real desire to play it. When it launched we didn't even log in. We probably never would have, only a friend, who was also in both our GW2 guild and our old Rift guild, left GW2 for Rift so she could build houses with the new Dimensions feature. Her positive feedback eventually convinced Mrs Bhagpuss to go take a look at the housing there, which happened to co-incide with the F2P conversion in 2013. I went along to try Storm Legion. It was dour and dull. I lasted less than two weeks. Mrs Bhagpuss spent all her free cash shop credits on fixings and furniture, stayed for about a month , then left, never to return. Since then I have dipped in and out, now and again, on a new F2P account and on my old one with all the perks. I never spent any of my store credits, all 19,290 of them. On Saturday, I logged in and blew a couple of thousand on the shortest period of Patron Status available, two weeks. Two hours would have been plenty. One, if I could have skipped the tutorial. Rift always had a terrible problem with its opening act. The tutorial is numbingly tedious, full of technobabble and lore twaddle that makes no sense, plus a lot of shouting and yelling and explosions. It's supposed to create a sense of excitement and urgency but it just makes for an extremely annoying roadblock to the game you came to play. A few years in Trion added an option to skip the Tutorial but that seems to have been removed for Prime. Unless I missed it. Anyway, I slogged through the tutorial for the umpteenth time, rolling my eyes. I think they might have shortened it a bit. It only took me half an hour. All the time I was "entertained" by a perpetual stream of moaning, complaining, swearing, boasting and arguing in the default chat channel, which seemed to be set to Level 1-29. To call it disheartening would be a major understatement. It was grim. There appeared to be a very large number of players with nothing better to do than talk incessantly about what a bad time they were having, how Trion could have done it better or what great things they would do when they got past all the annoying leveling stuff to the Raids they came for. That stream of collective consciousness continued unabated for the entire two hours I played. If anyone who was actually between levels 1 and 29 ever spoke about the content in those zones I must have lost it in the static. Rift's scene-setting problems don't end when you get out of the tutorial. The game dumps you at the wrong end of the starter zone and throws a whole lot more lore nonsense at you before offering you the first of what will be a seemingly endless series of the most mundane, trivial quests ever seen in a major MMO. 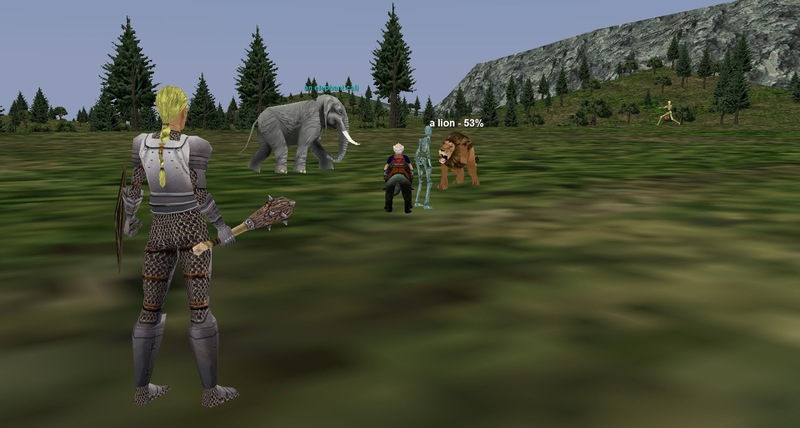 At root, Rift is a very old-school quest-hub theme park MMORPG, extremely closely modeled on WoW but with absolutely none of WoW's elan or imagination. I honestly think I have never seen so many lacklustre quests in one game. Even the dullest of imported F2Ps has more to offer in terms of wit or imagination than this. That doesn't matter as much as it should because no-one comes to Rift for the questing or the lore or the story. These days they might come for the Raids, I guess, or the Dimensions. Back at launch everyone came for two things: the Rifts and Invasions and the flexible, innovative"Soul" class system. It always took too long before you found your first Rift or got run over by your first invasion. This time I almost logged off in frustration before - almost an hour and three-quarters after I left character creation - I heard the familiar blast of brass that signals a major invasion. I'd found a couple of Rifts by then. They were disappointing. I did one with two other people and one in a duo. Both failed. There were scores of players all around but no-one seemed interested. Rifts, apparently, were giving really terrible xp when Prime launched and everyone had immediately learned to avoid them. Trion buffed that xp but from what I was getting it was still very poor. The invasion, when it came, was better. People did join in to do that and I got a very brief and faint reminder of how exciting it used to be. Even so, there was none of the genuine thrill we used to feel, no hint of players co-ordinating defence or working towards a common end. There were no call-outs in chat, no-one organizing groups, none of the desperate racing from Rift to Rift to close them down before the event failed. By the time the Invasion ended I was just shy of Level 8. I finished a couple of quests to ding just out of a sense of tidiness. Then I logged out. I haven't logged in again. For me, the lure of Rift in those first few months was always the Rifts and Invasions. For as long as the community was focused on those, taking them seriously and responding to them enthusiastically, I remained involved and committed. 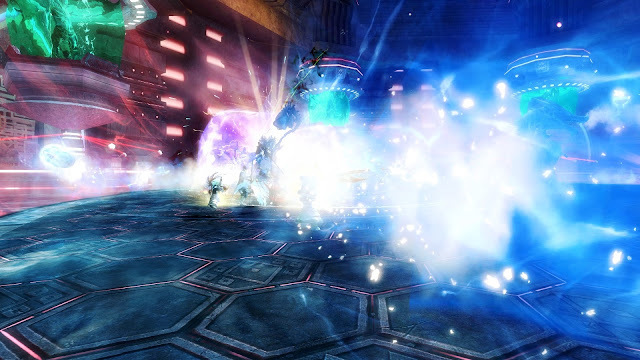 As the months passed, Trion made numerous changes to both Invasions and Rifts that made them less appealing, less exciting, less essential. By the time we had Raids and Crafting Rifts and PvP Rifts and Lures the whole point of the exercise had been lost, for me anyway. ArenaNet took the concept that Trion had borrowed and expanded from Public Quests in Warhammer Online and blew it up into an entire gaming eco-system with GW2. Going back to Rift now, even a highly populated Rift Prime with actual Rifts and Invasions is like going back to watching television on a 12" B&W portable when you're used to a 48" plasma screen. I still would play Rift again, if the game could guarantee a steady stream of those zone-wide Invasions along with a population of players ready and willing to do battle with them. And that might happen - for a while - in the mid/end-game zones, Iron Pine Peaks, Shimmersands and Stillmoor. I'd love to see that but I'm not going to grind through forty levels of brain-sappingly boring quests to get there. Whether Rift Prime will be a commercial success for Trion the way Progression servers have been for SOE/DBG I very much doubt. 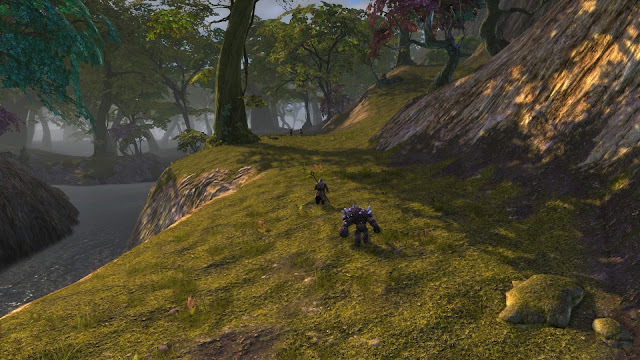 Rift simply doesn't have the depth or breadth of content of either of the EverQuest games, nor the nostalgia factor. Trion, as Brasse's comment on this Massively OP thread confirms, are well aware that interest in Prime may not be sustained. Mine certainly wasn't. I might log in again before my two weeks Patron access expires. I won't be buying any more. Not even with credits. P.S. For a much more detailed and considered review, try this at Endgame Viable. It wasn't up when I wrote my post or I'd have worked it in!